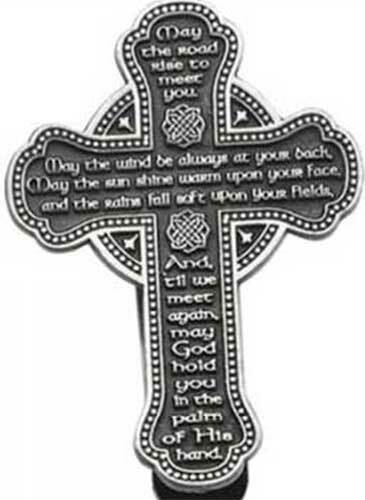 The pewter Irish blessing Celtic cross car visor clip measures 2 1/2" tall x 1 3/4" wide and attaches with a metal spring clip. The Irish visor clip is gift boxed with Celtic knot and Celtic cross history cards, compliments of The Irish Gift House. This Irish car visor clip is made from free pewter and Never drive faster than your guardian angel can fly! is printed on the package.